(16/P96) TRENTON – With the arrival of the fall breeding season, the Department of Environmental Protection’s Division of Fish and Wildlife is reminding motorists to be alert for white-tailed deer, which may unexpectedly dart onto roads and cause accidents. Motorists are urged to be especially attentive and cautious during morning and evening commutes when visibility may be poor. Deer are involved in thousands of collisions annually in New Jersey, with as many as half coming during the fall mating season, or rutting season, which peaks in November. An adult male deer can weigh 150 pounds or more. During rutting season, deer are most active in the very early morning and around sunset, when visibility conditions can be very difficult. This is when bucks are most actively pursuing does. Using caution while driving will become even more important when Daylight Saving Time ends November 6, causing commutes to align with periods when deer are most active. For motorists, low levels of light and sun glare can make it very difficult to see deer that are about to cross the road. Moreover, multiple deer may cross the road at any given moment, usually in a single file. 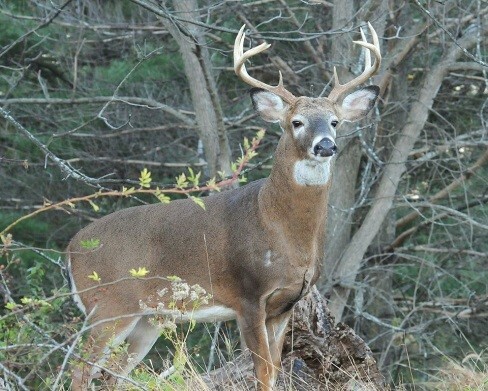 Peak rutting season for deer in New Jersey runs from late October, throughout November, and into mid-December in all areas of the state, beginning earliest in northern regions. If you see a deer, slow down and pay attention to possible sudden movement. If the deer doesn’t move, don’t go around it. Wait for the deer to pass and the road is clear. If you are traveling after dark, use high beams when there is no oncoming traffic. High beams will be reflected by the eyes of deer on or near roads. If you see one deer, be on guard: others may be in the area. Deer typically move in family groups at this time of year and cross roads single-file. Always wear a seatbelt, as required by law. Drive at a safe and sensible speed, considering weather, available lighting, traffic, curves and other road conditions. Obey the state’s hands-free device law or, better yet, avoid any distractions by refraining from using cellular devices while driving. As a result of New Jersey’s proactive deer management policies, the estimated population of deer in New Jersey, derived from a formula based on deer harvested in hunting seasons, is about 101,000, down from 204,000 in 1995. This does not factor in deer inhabiting areas where hunting is not permitted. The DEP’s Community-Based Deer Management Program is available to help municipalities control deer in areas where sport hunting is not a viable management tool.